It all started in a sports bar in Toronto. Michael Schumacher had just won the 2001 F1 Formula Championship and Franco Corona, overjoyed by this win, found himself surrounded by likeminded fans. Working for a charitable organization at the time and having an extensive background in fundraising, he couldn’t let an opportune moment like this slip. We were winning everything at the time, people couldn’t hold in their excitement. I had a couple of Ferrari t-shirts and two hats in the car and thought why not? Using the tools he had available, a couple sheets of scrap paper and a handful of pens, he started a raffle to raise money for Mens Sana, a charity collecting for schizophrenia. 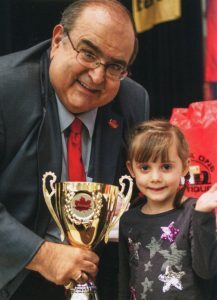 When the raffle closed Franco had raised over $2600, which in turn raised a legitimate question. What could be accomplished with some organized effort backing it? These are the humble yet powerful beginnings of Friends of Ferrari, a fundraising initiative that over the years has raised over 2.5 million dollars in charitable donations. Building from the raffle model that he had quickly perfected, Franco had the clever idea of donating all funds raised to various charities in the name of Ferrari. This promptly grabbed the attention of Ferrari themselves who, in a comical way, kindly asked Franco to redesign the friends of Ferrari logo in order to differentiate the corporation from the campaign. They arranged for Franco to come to Maranello, home of the Ferrari headquarters, and expressed their desire for Franco to continue with his initiative but to adhere to copyright patent laws and not use the horse in his logo. Unfortunately, due to corporate policy, Ferrari was unable to donate any money to Friends of Ferrari. As luck would have it though, help from Ferrari came in an entirely unique and innovative form. They had 20 electric cars that were ultimately a scaled down model of an F1 racer in California. Instead of shipping them back to Italy they decided to give them to me! We sold half the cars in a lottery to raise a substantive amount and kept the remaining 10. 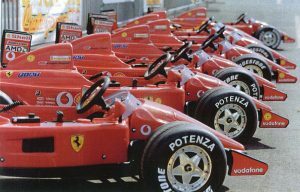 Thus began, in 2003, the first season of the Friends of Ferrari Grand Prix in Toronto. A series of scheduled races for local kids to participate in where 100% of all funds raised, through sponsorships and donations, went directly to charity. Franco wanted the participating kids to experience what F1 racing meant first hand. There was a medal ceremony, giant bottles of sparkling apple juice, corporate branding of the vehicles, as well as official Ferrari racing suits and gear. Canadian Tire would also donate a bike to each race that was given to one of the lucky participants. Finally the winner of the race would win a trip to Italy with their parents to visit the Ferrari headquarters in Maranello. “Every child who applied would race, I am really proud of that…unless of course they couldn’t fit into the cars!” Franco laughs. Franco and his wife also held annual luncheons to raise money for more races and other charities that they were donating to at the time. These typically consisted of guest lists of at least 500 people which included the presence of various distinguished individuals such as Mark Mckoy, Andy Bathgate, and Perdita Felicien. One year in particular was a highlight for Franco, when he organized Janro Trulli, Italian F1 racer that had just won the Monaco Grand Prix that same year, to attend. No one believed me that he was going to be there so just imagine the shock and surprise when he actually showed up! Not only was his presence a huge help in raising money for the kids but he himself also handed me a $10,000 cheque in support of the initiative. I was overjoyed! Trulli, who owns a private Vineyard, also donated and supplied all the wine for the event. 2015 was Franco’s final year with Friends of Ferrari. Its the kids that I will remember the most and that ultimately made it all worth it. His favourite memory so far revolves around a War Amps CHAMP who only had one arm and ended up winning the race. Through this win and participation the child quickly became a hero at his school and even got a headlining spot in a local newspaper. He also won the trip to Italy with his parents and Franco says he could think of no one else who deserved this win more. Raising over 2.5 million dollars since he and his wife started Friends of Ferrari back in 2001 many charitable organizations like the Vancouver Foundation, the War-Amps Champs, Centro Dino Ferrari, the Aboriginal Mother Centre, and the Italian Cultural Centre have been positively impacted and supported. 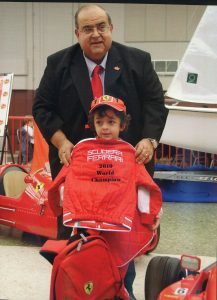 Although Franco has now passed the Friends of Ferrari torch, his legacy of altruism and charity lives on. Franco’s contributions to not only his community, but to the future are seen as inspirational and will always be remembered. Il Centro Italian Cultural Centre is proud to showcase archived items from Friends of Ferrari, such as one of the cars and racing outfits as well as the Franco and Suzann Corona Collection of Presepe (Nativity Scenes). We encourage visitors to the Centre to look upon these exhibits with pride as they represent a man and wife who dedicated themselves making this world a better place for all.